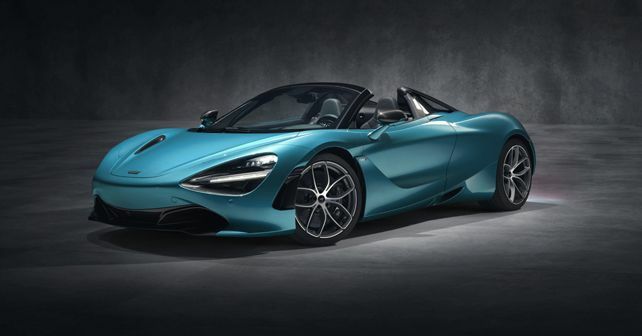 Nearly two weeks after teasing its latest creation, McLaren Automotive has laid all doubts to rest with the all-new 720S Spider, the second new model launched under its £1.2billion Track25 business plan. After refreshing its Sports Series with the 600LT and revealing the three-seater Speedtail 'Hyper-GT' earlier this year, McLaren has now updated its Super Series by introducing the 720S Spider, the British marque's third new model this year. While the 720S Coupe is revered by auto journalists around the world for its blistering performance, purists won't be let down by its drop-top iteration either as both versions share an identical 0-100km/h time of 2.9 seconds. Seems too good to believe, then? Well, here's the clever bit. As we all know, a drop-top model acquires more weight than its coupe sibling in the form of additional strengthening material required to compensate for the missing fixed roof. However, folks at McLaren have limited this weight gain to a mere 49kg, which gives the 720S Spider a dry weight of just 1,332kg. To put things into perspective, the 720S Spider weighs 88kg less than its closest rival, the Ferrari 488 Spider. All this weight-shedding comes courtesy of a reworked version of the 720S Coupe's carbon-fibre 'Monocage II' monocoque, dubbed as the 'Monocage II-S' which does not feature a central 'spine' running from the front to the rear of the cabin. The weight addition has been kept to a minimum with a new, electrically-actuated Retractable Hard Top (RHT). Folks at McLaren claim that the new RHT takes 11 seconds to lower or raise, making it six seconds quicker than the 650S Spider's roof. Also, it can now be operated at speeds of up to 50km/h. Mechanically, the convertible shares its heart with the coupe which means that the 720S Spider is powered by the same 4.0-litre twin-turbo M840T V8 motor which develops 710bhp and 770Nm of torque. The power is sent to the rear wheels via a seven-speed SSG gearbox with three selectable drive modes: Comfort, Sport and Track. The new 720S Spider will be available in the same three specifications as the Coupe, with Performance and Luxury trims extending above the standard model. Two new exterior colours – Belize Blue and Aztec Gold – have been introduced for the new Spider among a palette of 23 colours. While the order books for the 720S Spider are officially open, deliveries are slated to begin in March 2019.